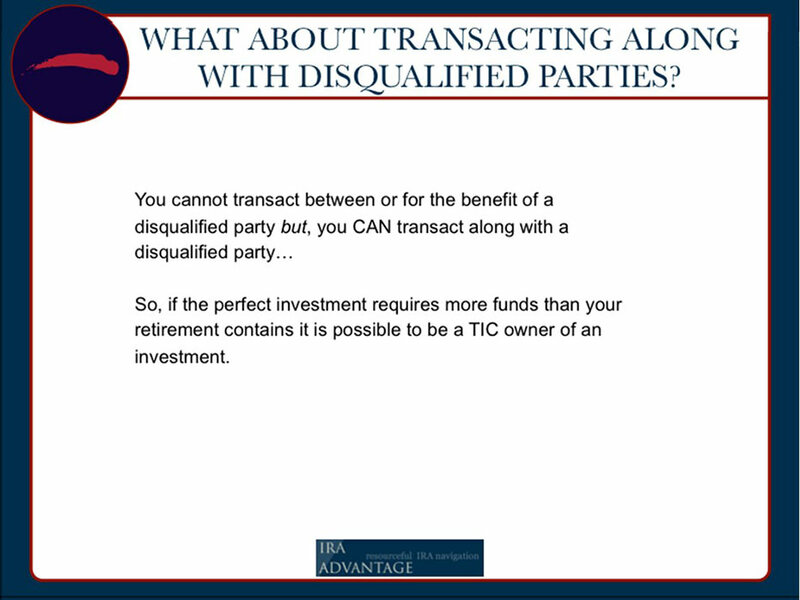 Wondering how to navigate transacting WITH disqualified parties for your real estate IRA investing? In this episode of Self-Directed IRA Basics, David Moore covers the ins and outs of working WITH disqualified parties for your IRA, and how to put yourself in position for a successful transaction. As I said, it’s a prohibited transaction to transact between or for the benefit of the disqualified party, but it’s fine to transact along with one. When we’re looking at, “Can I go out and buy a property along with my plan? 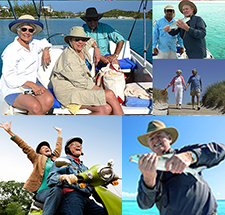 Yes I can.” As I said, your traditional IRA and your Roth IRA are disqualified parties from one another, and you can combine those. If I’ve got people come in and they’re in their twenties, we’re probably going to do two different accounts. We would do two different checkbook IRAs for them because they’re contributing money over a number of years and we’ve got to have that flexibility to allow them to make those contributions. If we were talking about somebody that comes in that’s my age, we’re probably only going to do one. We’re going to do one checkbook IRA and we’ll have the two different accounts, maybe the spouses each have an IRA and we’ll have both of those IRAs as members of a common LLC. The benefit of that is you’ve got one entity, not multiple. The downside is as soon as we funded that investment (the investment in the LLC), that entity should be stacked. You shouldn’t be adding funds from either disqualified party in the future. When we’re looking at joint ownership of something, if we’re creating a limited liability company that’s got a group of us in there, and maybe you’ve got planned money and personal money in there, what we want to do is over fund that investment in that LLC. That way, if there’s a downfall, or some shortfall with money or something you are still covered. Anybody in the room that’s had income properties knows that once in a while you have some unforeseen expenses. But, how do you address that? How do you cover it? That’s why we (and banks) want to see some reserves in those accounts for that rainy day you hope never comes. Could you recapitalize if you did the same percentage? Our position is you probably should not, but will it get done with a custodian? Yes, and there’s arguments that it would be fine. The issue is let’s say we put a limited liability company together, and it’s got two disqualified members. When we fund that thing, as I said, we probably want to put additional money into it just in case. If we know that money is coming in, let’s say you say, “Okay. Hey, we’re putting it together now, but we’re a couple months from 2018 and we want to be able to make 2018’s contribution too, so we’re going to have additional chunk of money”, or maybe I’ve got something else that’s paying off. I’ve got some other investment that are going to mature and I know I want to put this additional money into the LLC too, but it’s not there today. What we can do is have the additional money come in with a note, so that note would just get paid off and the funds would come in offsetting it. Now it might take six months, and we wouldn’t have to have all the money initially at inception. We could have it come in later if it’s via that structure in the initial funding of these LLCs, because that LLC’s not a disqualified party until it’s populated. As soon as it’s populated by these disqualified parties, then a transaction between that entity and any other entity that’s a disqualified party is what we’re concerned about. Additional investments in the LLC, like when you’re issuing additional membership interest if you’ve got more in… that’s where we see it as an issue. Custodians will regularly make that investment, and we’ve had conversations with them and they don’t really see it as a problem. So I think it’s one of those things where it’s not a problem until it is a problem. We’re just going to look at it and be conservative. Self-Directed IRA's: WHO and WHAT Are Disqualified Parties To Your IRA?